CINCINNATI — Pete Rose always had an excellent rapport with Marty Brennaman. When 76-year-old Brennaman announced Wednesday he would retire after the 2019 season — his 46th year in the Reds radio booth — the former star lauded the broadcaster whose voice became synonymous with the Reds' glory days. “I love Marty to death,” Rose, 77, told WCPO in a phone interview from Las Vegas. “Marty has always been fair to me. He would always call me in different situations. I call him on the road periodically when something happens with the Reds. " Brennaman became well-known for making several famous radio calls throughout his career, including the momentous occasion of Rose’s record-breaking 4,192nd career hit Sept. 11, 1985, at Riverfront Stadium. Brennaman also called the Reds World Series championships in 1975, 1976 and 1990. 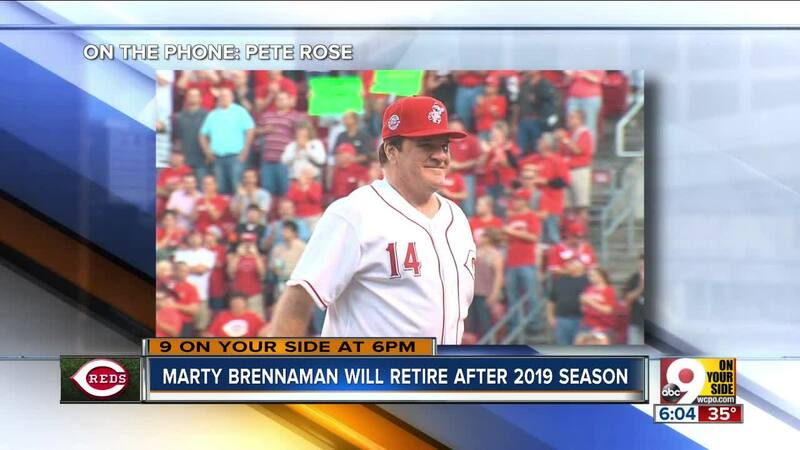 Rose said he always enjoyed the fact that Brennaman was knowledgeable about the game. Rose was not surprised Brennaman is entering his 46th season but knows the team’s recent struggles have been difficult on his friend. Rose said he has a great deal of respect for Brennaman’s longevity in the role. “Let me tell you something,” Rose said. “I believe that it’s probably easier to do games in that booth when the team is good as opposed to being a bad team. Marty, like everyone else, he’s going to do games every day, travel with the guys on the airplanes, in the hotels – he becomes part of them. He lives and dies with what the team does. As a Reds player, Rose said he enjoyed going out to eat with Brennaman. He appreciated the fact that Brennaman was confident in the radio booth and didn’t sugarcoat what happened during a game. “Marty was secure with his job — that’s why he called it the way he saw it,” Rose said. “He’s not going to massage something up in the booth. If you do something and screw up, he’s going to tell the people that aren’t watching that are listening what happened. He’s knowledgeable enough about the game — he knows when a player should’ve hit this guy or a player should’ve got this guy over.